Whether you call them instructional, how-to or educational videos, they are one of the simplest types of videos that you can begin making for your blog. Here’s the thing: You don’t have to be on camera in order to teach your audience through video. But it is really helpful for you to be on camera, at least at the beginning and the end of your instructional videos, so your audience can connect with you as a person, instead of just a voice that they hear. Start with an Open where you’re talking on camera, introducing yourself and the topic. Transition to a Demonstration where you demonstrate something on camera and we hear you narrating the play-by-play through a voiceover. End the video with a Close where you’re back talking on camera, wrapping up the topic and maybe offering a next step for your viewer to take. One example of this kind of structure could be you showing your audience one of your favorite tools and how to get started using it. So why can the OPEN → DEMONSTRATE → CLOSE video structure work? Well, people like stories and this structure gives your lessons a natural beginning, middle and end for your audience. This structure really simplifies your process to make the video by enabling you to focus on filming it in segments, instead of doing it all in one go. You want to leave a lasting impression with your viewers, right? Take a moment and consider one person you started learning from online. Pick the first person who comes to mind. I bet she taught you something on video, right? Was she on camera (talking to you), or did you only get to hear her voice (while seeing slides on screen)? I could guess, but let me know in the comments below. 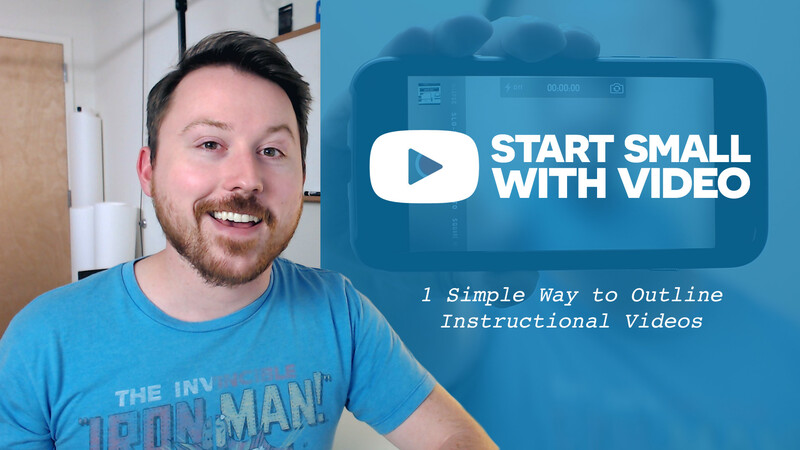 Go to your list of video ideas and pick 2 of the instructional ones to work on right now. If you don’t have a running collection of video ideas yet…Go check out my post on The Video-Making Mindset. Take 30 minutes and use the OPEN → DEMO → CLOSE structure to outline each instructional video. By the end these few steps, you’ll have two video outlines ready to shoot!